wonderful study of reeds and colour. wow great colors and beautiful picture.it's soooo tranquil.goes to my favorite. what are those curtain like things? grass? A great work.. in deed.. Very nice. 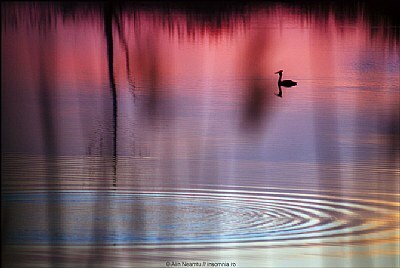 Like the ripples and the inclusion of the bird adds to the shot. Interesting shot. I like the colors that come out in the ripples. Are we looking through something like mosquito netting?